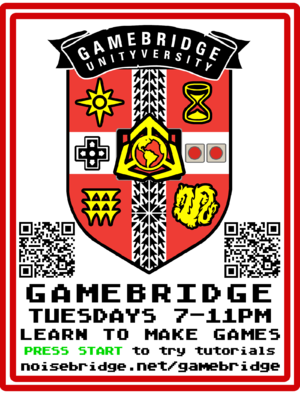 Gamebridge Unityversity is a weekly Unity game dev meetup and beginner-friendly class for anyone who wants to learn programming, game design, art, music, and how to teach game dev. All skill levels and kinds of game devs are welcome. Gamebridge Unityversity's new web site is online with updated versions of our tutorials, resources, and recorded weekly live Twitch streams of our classes (sometimes). Come to Noisebridge Tuesdays to learn to make games, music, art and hackerspace consensus. 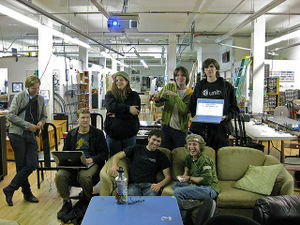 Participants can join in Noisebridge meetings and learn how to take part in the community. Monday nights is Botbridge robot hacking. Learn to make robot bodies bridging game AIs into reality. Sunday mornings is Algorithms study group. Learn computer science techniques for problem solving. To enter, ring the payphone doorbell and you'll be buzzed in. Ask us for an access token to be able to enter without buzzing in. Whatever topics participants are interested in learning. Contact our volunteer mentors who lead tutorials every week. Laptops, especially ones with decent 3D graphics cards. To run Unity3D you'll need one running Mac or Windows. Mouse (trackpads are hard to use for 3D and game dev). Adapters you may need to hook your laptop to the big projector screen to show off your games and development processes to the group. Do some Unity Learn tutorials and allocate some time each week to continue doing more. Gamebridge is the subject of an article written about in the Examiner by David Cox, who teaches game design at CCSF. The Hackerspaces app is a 3D browser of the hackerspaces on and around Earth. A collaborative game project in which we explore new tutorials every week. We are working on developing new Unity tutorials for future hackers to do at Hack The Future events. Simbridge is one of our group projects. It is a collaboratively created virtual Noisebridge game. Learn more about how to help simulate Noisebridge and learn Unity, C# and 3D art in the process! Help create a Mixed Reality Project for use with your smartphone and Cardboard or other like devices! You can teach yourself the curriculum taught at Gamebridge by following the Gamebridge Tutorials and Unity Learn tutorials. Feel free to add new lesson ideas there and let us know if you have suggestions. Support for making 3D and 2D games with ready-to-use 3D 1st person, 3D 3rd person, 2D sidescroller and 2D overhead rogue-like RPG characters as well as rolling balls, cars and aircraft. Lots of documentation, tutorials and even online classes from schools to learn Unity. The ability to build once and launch on multiple platforms. Relatively easy coding framework to learn. Also as a designer it cannot be understated the usefulness of being able to play the game at any moment without waiting for a build cycle, and the ability for developers to list important features as Public Var's which unity will automatically look for and generate slider scales that designers can modify without having to touch the code base. The largest user base. This is important because at some point you will need to work with others to make great games, and if everyone else is already using Unity they will not likely switch to your engine or preference....unless you pay them. The Unity asset store is another way for developers, artists and musicians to make money by creating game tools/assets. But it's also a way to develop your own games much much faster. I (Alex) now maintain a Linux desktop running Unity editor for testing purposes and I can recommend it though Mac and Windows builds are still more stable and supported. [Unity's Linux release notes thread] always has the latest download links. We had our first meetup November 2012 November 4th and it was a lot of fun. We made a game about evil companion cubes that want to give you a hug for very explosive definitions of hug. We were on hiatus for a while while Alex was away but we're back in action. You can download an abundance of free resources such as code, art, tools and audio to make your game awesome. Game engines make it pretty easy to develop games by giving you lots of development tools for world building and scripting. We're interested in other kinds of game development too, including non-computer game designs like dice-based RPGs, board games and card games. Unity is an awesome game development engine based on Mono that compiles for Mac, Windows, iPhone, Web and Wii with support coming soon for PS3 and XBox. Unity has just been made free for indy developers. Unity is an extremely easy to learn game development environment with a massively helpful developer community. We are primarily teaching and collaborating with Unity in Game Club because it is incredibly awesome and easy to learn. Unity3D on Wine works with only a couple small bugs so you can create Unity games on Ubuntu too! START HERE: Unity Tutorials are free to download and can be completed in a day or two! Do these before coming or do them with us to get help and support. C# is the language you should learn to do Unity programming. Unity-Tutorials.com has $15 tutorials on topics like particles, gizmos, character rigging, animation and Cheetah 3D. There are other game engines. Unreal Development Kit is also available for free now. We'll no doubt be playing with that as well. Unreal is some seriously advanced game dev technology. Objective C: Some people are making iPhone games directly in Cocoa. Blender Game Engine: Blender Game Engine is an open-source game engine integrated with the Blender 3D studio software. It has come a long way in recent versions and some of the games people have made with it are amazing. OGRE Open Source 3D Engine: OGRE is not a full game engine but it does have Mac, Windows, Linux and iPhone support. It has recently been used to make a big hit called Torchlight. SDL: SDL is a cross-platform open-source game development library that has been used to make Aleph One based on the Marathon series. Game development involves lots of tools for modeling, sculpting, texturing, rigging and animating game environments. Yobi3D is a 3D model search engine. You can search with simple keywords and see the results in 3D. SketchUp is a surprisingly powerful and incredibly easy to use 3D modeling application for making basic 3D geometry to use in your game development. Google 3D Warehouse is a searchable library of free 3D models in SketchUp format that you can download freely and use in your games. You can also upload your own creations to 3D Warehouse. FreeSound Project is a searchable library of free sound files that you can use in your games. You can also upload your sounds to FreeSound for others to use. All CG Textures has loads of quality free textures. Maya is the #1 3D content creation tool for games. We're looking for people with Maya experience who can teach how to use Maya. Especially interested in learning about character rigging and animation. Blender is an open-source 3D studio that can do mostly the same things as Maya for free. We're looking for people who want to teach Blender skills. Creative Crash has many free 3D character rigs in Maya format. This page was last modified on 30 January 2019, at 08:42.